At 23, Sean Bretz was the picture of health. 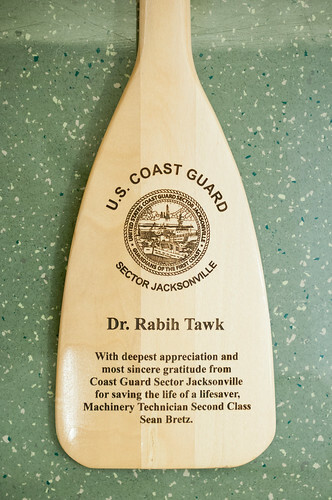 As a member of the U.S. Coast Guard Sector Jacksonville, you’d expect nothing less. But then last June 5, the machinery technician woke up with what he described as “an excruciating headache.” Attributing it to a late night out with friends, Bretz didn’t think much of it and headed to the kitchen, hoping food might help. Instead he collapsed. Friends thought he’d had a seizure. They called 911 and Bretz was transported to Mayo Clinic where doctors determined a giant aneurysm had burst in his brain, causing a massive stroke. Prognosis was grim. Despite surgery to stop the bleeding, Bretz had significant brain swelling and was kept in a medically-induced coma. Surgeons had to remove a portion of his skull in attempt to relieve the swelling. When he awoke he’d lost his ability to walk, talk, and even swallow. At one point Bretz could only move his left thumb. Doctors found that the aneurysm in his brain was still growing so additional surgery was needed. Surgeons implanted a new FDA-approved stent in his brain to help divert the flow of blood and force the aneurysm to dissolve. But recovery was an uphill battle. Daily, there were issues and set-backs – which Noel described as “a minute by minute emotional roller coaster. Family, friends and colleagues rallied around him. 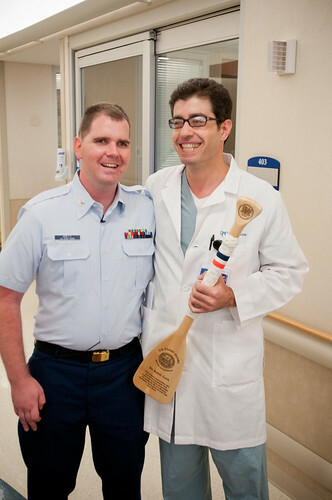 USCG Sector Jacksonville commanding officer Captain Andy Blomme encouraged his troops to visit Bretz and show support for their fellow “Coastie.” Bretz never failed to have a steady stream of visitors. And slowly, he improved. “Sean is stubborn,” says Noel. 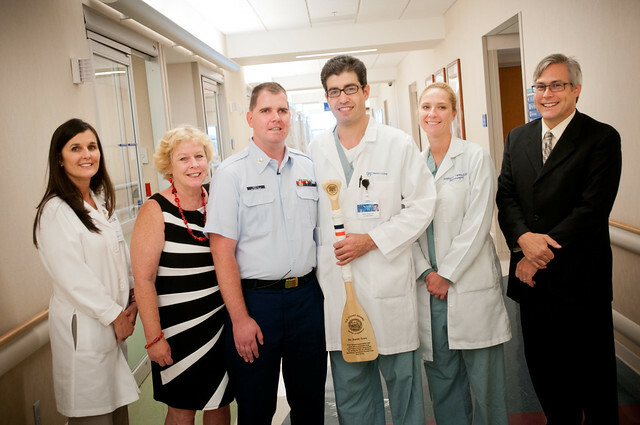 Within two months, Bretz was making remarkable progress – he was able to salute Capt. Blomme with his left hand. And by the fall, he was able to walk – albeit slowly and a few steps. He continued his arduous recovery and rehabilitation near Savannah, Ga., with the help of his mother and ongoing military support. Almost a year to the day of his stroke, Bretz returned to Jacksonville to attend the change of command ceremony at U.S. Naval Station Mayport. He walked into the crowd, unaided, in full uniform– something that did not go unnoticed. Today, Bretz continues with therapy but has made a “fascinating recovery,” says internventional neurosurgeon Rabih Tawk, M.D., a member of Mayo Clinic’s stroke team. “He’s done remarkably well considering where he was. Sean’s is a story that is about good luck and using every treatment and technology available in 2012, which worked for him,” Dr. Tawk says. Though he still has some deficits and will need additional surgery, Bretz celebrates his independence daily. “For the most part, I am able to do everything for myself with the exception of run and drive.” He hopes to soon be back behind the wheel of his pickup and eventually back at work, the latter of which sometimes surprises him. And in the eyes of his fellow guardsmen, Bretz certainly lives up to the last line of the Coast Guard creed: “With God’s help, I shall endeavor to be one of His noblest Works…"
What a story! You are an inspiration! Prayers are always with you.